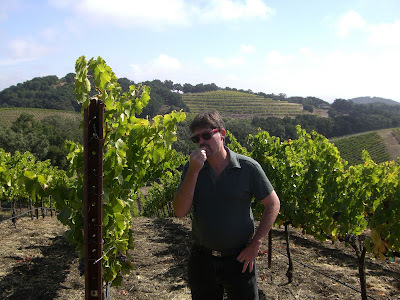 The Gray Report: Hurray for California's "bad" 2011 vintage! What makes a great vintage in California? According to Wine Spectator and the Wine Advocate, it's a hot, dry summer where the grapes get really ripe. For the last fortnight hard rains hit northern California, and people who hadn't yet picked their grapes -- which included most makers of red wine -- are now dealing with water-bloated berries and botrytis. They're praying for hot dry weather so they can get their grapes ripe and concentrated. So they can make those 16% alcohol Cabernet Sauvignons we all know and love. Many, perhaps most, will fail. They face unpleasant choices: Harvest and make a less-concentrated wine, or leave the grapes unharvested. The latter could be financially ruinous, so perhaps most will do the former. That could be the best thing to happen to California wine in years. It comes just at the right time, as the "balance backlash" has more sommeliers and regular people asking for wines that aren't overpowering blockbusters. The 2011 vintage could show Europhiles exactly how good the wines of California can be. But that's not how most in the industry are currently seeing it. Take a look at this typically well-reported story by Wine Spectator. Tim Fish and Augustus Weed do a nice job of calling the right people and getting good quotes. But it's all written from the perspective of a magazine that consistently praises low-acid, high-alcohol California wines, and sees leaner, more age-worthy wines as failures. Whether or not to pick before the rains was a tough call for growers. "A lot of the Chardonnay, especially in Russian River, was just not ready," said Bill Knuttel, winemaker at Dry Creek Vineyards. Many grape contracts between growers and wineries dictate a minimum level of Brix, which is a measurement of sugar content. A Brix level of 24 is a typical goal, but before the rain many of the vineyards were reading 22.5 or less, which would translate to about 12.5 percent alcohol. I want to drink those Chardonnays! I want to drink them waaaay more than I want to drink a bloated, low-acid bowl of pineapple, butter and vanilla. "If we felt the fruit was within three or four days of being optimal, we picked before the rains hit," winemaker Brian Loring said. Hurray! Grapes are like aging ballplayers: better to move them too early than too late. "The sugars are definitely going to be lower this year and we are going to see lower alcohol," said Anna Monticelli, winemaker at Piña Cellars. "The big, ripe style of wine is going to be hard to find in 2011; I don't care how much concentrate you use." I feel sorry for growers and winemakers whose livelihoods are threatened; really I do. But that sentence fills me with joy. In 1997, Parker and Spectator declared the vintage one of California's best ever. Those wines are mostly dead now; with no acid, they became undrinkable fast. The following year, 1998, was rainy and all major critics trashed the vintage (disclosure: a younger and stupider W. Blake Gray was on that bandwagon.) Some wineries actually made no '98s; the rest had to sell them for lower prices. Those wines are generally drinking beautifully now. If 2011 is another 1998, I feel sorry for the business side of the industry. But there's a good chance that in 2025, those of us who don't feel the same way as the Spectator and the Advocate about what makes a good wine will still be celebrating the first "bad" California vintage of the 21st century. I've recently tried a handful of 1998 California cabs. They have been universally satisfying. I was thrilled to see that 2011 could be another 1998. I could not agree more! This is the type of vintage that we love. Balance and elegance! PS: I'm not "anonymous" but Rich - just wouldn't sign me in to my account! Blake, I agree completely with your main point, and I like to drink the same wines you do, but I think you have glossed two very important issues. First, is rot. Sure, pick before the rain. . . that is a great idea if you had chardonnay hanging on Oct 3. Pity the fools who didn't pick. Cabernet? No way! You wouldn't get bordeaux, you would get a big old nasty pile of something nobody (and I mean nobody) wants to drink. Fortunately, Cab is thick skinned. But it has been by no means immune to rot. Bigger question: Zinfandel. A rot prone, thin skinned, uneven ripening variety. Waaay too early for most. Really, you don't want to drink that wine if the grapes were picked Oct 3 (white zin anyone?). At least in most places. Second is the curious caption to the photo. On the contrary, that is a GREAT way to determine ripeness. Ironically, picking taste (and other sensory characteristics like sight and touch) is much more likely to lead to balanced wines like you prefer. Picking by chemistry is much more likely to lead to overblown, unbalanced, etc. Anon: About picking by taste, it makes intuitive sense, but I can tell you that almost every person I've ever asked about an overripe wine said they picked by taste of the grapes. I think it's as simple as realizing that a good grape for wine doesn't taste the same as a good grape for eating. But anecdotally, and in many countries, a lot of winemakers don't realize this. Our harvest starts in earnest today. We're picking our Syrah for another winemaker, who has decided that it tastes perfect even if it is only 22.5° Brix. The flavors are there, the seeds are ripe, the skins have the expected texture, and the acids are not screaming. Tomorrow we start to pick our Pinot. 2001 is not 1998, or 2000, or 1989. Yes all those were cold and wet vintages but this one is unique among the 25 I have done. In general, the yields are very low. Rot is a huge factor for many Pinot, Zinfandel, and especially Chardonnay growers here in the North Coast. Since the rains some of that fruit has been turning to slop on the vines. The 0.5" we got this last Monday did more damage than the 1.5" we got the week before. The most unusual thing I am seeing this vintage is fruit degradation in the absence of rot. In a "normal" vintage I expect to see the canopy begin to scenesce - the leaves yellowing and falling off - before the fruit gives up. This year, the canopies are still green and vigorous down to the basal leaves, but the fruit is falling apart, with the skins looking dull and berries just falling off the clusters - though no evidence of rot. RE: picking by taste - everyone picks by taste. Overripe wines are made from grapes that taste overripe. Winemakers that make overripe wines are looking for that taste profile. Under-ripe fruit taste under-ripe and makes wines that taste thin, acidic and generally flavorless - with those flavors present being unpleasant. When fruit is ripe enough to make good-tasting wine encompasses a number of factors. Give us a little credit - most of us do know our business. Please don't leave Oregon out of the mix! As of today, Ootober 18, we have not picked a single Pinot Noir cluster. Have a look at our Julian Calendar and you can read up on our "failed" vintage. Amen John. I always tend to be an early picker, especially when it comes to Zinfandel, and this year was no exception. The same with the Syrah at your place, where it tastes great, turns black in the bag while sampling, and has proper acid/ph balance. Generally, this is a year where the combination of site and grower is of paramount importance-- those that have not hung too much fruit, have aggressively green-thinned, and culled for botrytis (at Hudson and Weill Vineyards the crews are going through and dropping any rot on the ground today in front of tomorrows picks). I have not doubt the resulting wines will be excellent. Generally I am overjoyed with this harvest. I do not have a single Zinfandel lot of the 26 in the winery over 15.5% alcohol, the wines are exhibiting great color, lower than normal pH's at this point, and very pure fruit. Some more resemble classic St. Emilion more than Zinfandel right now-- seriously. I think once all the malic acid (which are running quite high this year) is consumed we will have some of the best wines from our winery yet. They might not get as much critical acclaim but I think, like 1999, this is going to be a sleep Zinfandel year and a very good Syrah year. Yes, there will be some bad wines out there this vintage but I would suggest there will be no more dogs than in hot years like 2003 and 2004, heavy crop year like 2005, or even 2001 or 2002. As always, it comes down to site, grower, and winemaker. Gotta love that classic David Graves quote! RE: "This is the worst way to decide if grapes are ripe enough" - you must be listening to Dr. Richard Smart. For us, 2011 is shaping up to be a simply fantastic vintage for Sonoma Pinot. Although the Spring was rather jacked up (more of a quantity issue), the last couple months were superb. We were able to harvest everything prior to the rains with beautiful flavors, high natural acidities and low brix. We harvested a vineyard in the Sebastopol Hills area in the 22 Brix range and actually wanted to harvest it the week prior based on taste until we checked the sugars/acids. That prior week they were 20.5-21.2 Brix depending on the block. A big part of this was due to diligent work with our growers. With 2010 fresh in mind, they opened canopy and dropped fruit appropriately early. Can't wait to taste them all after MLs are finished. Andy here....I read this and the Chronicle article and just had to chuckle -- like there is really a whole lot of choice here. Mom Nature, for the most part, tells California winemakers whether they are going to make a more or less ripe style of wine (just like in France or Argentina etc). In a "typical" year, harvesting almost any red grape from almost any site in CA at 22 brix is going to make a thin, herbal wine. THis year, 22 brix is translating to physiologic ripiness in many sites (although my Paso grenache is at 25 brix but the pH is 3.17 and the seeds are green so it still needs some time...) . It will certainly be different, and thus far with the wines I've dealt with, its different good , but in reality the wines will simply be expressing their terroir (just like they do with riper wines in warmer years). what a joke... WS, WE, SA are mental wine migets who think they have an inkling of what the hell they are talking about. They should rent a car and come out to wine country and see for themselves. This will turn out to be a great vintage if for no other reason that the number moneys will NOT get their required 28 brix for their 16% alc crappola Pinot, and and yes, even some chard, Morons harvest at those breakneck sugar levels. Although each type of wine, according to the variety and local climate, corresponds to a specific harvest time, IMHO, a significant part of California wine growers is still obsessed with picking (whether by taste or relying on methods like ITV, Glories, Cromoenos…) only when grapes have achieved (the slippery notion of) “complete” phenolic maturity. While this approach is debatable from the viewpoint of the wine’s ability to age (after all most wines are supposed to be drunk young), it is objectionable from CA’s climate perspective (especially with respect to thin-skinned grapes like Pinot Noir); since in a normal growing season (in most parts of the North and Central Coast wine areas), October highs average in the upper 70’s, with relentless sunshine and no rain, and while phenolics are still developing, Brix levels continue to increase to the point that grapes have depleted almost all of its water and acid reserves. "...and while phenolics are still developing, Brix levels continue to increase to the point that grapes have depleted almost all of its water and acid reserves." Again, Peter - give us professionals some credit here. While we can't control the rain, we can control rate of sugar increase, vine water status and acid levels. There must be something very satisfying in being an armchair quarterback for so many people to engage in it so whole-heartedly! It seems pointless to respond to criticism by scorning theoretical knowledge in general (btw, theoretical physicists are way more valued than experimental physicists). I always give you full credit, though. The problem is that, to me, you seem like a 3-sigma or a tail event. However, I have to give credit to the facts and to my palate (opinion) as well! What I’m pointing out is that in CA’s lower-altitude coastal areas, due to several climatic factors (warm weather, lack of rain, high solar radiation levels), Brix levels increase rapidly and acids start to decrease long before phenolic maturity is reached. In addition, the maritime influence stretches the growing season and keeps the average highs in the upper 70’s throughout October. These warm late season temperatures accelerate the transformation of malic acid into sugar and as the grape looses water it also helps to reduce the amount of tartaric acid; making it extremely difficult for most red varieties to combine “complete” phenolic development with adequate water and acid levels. This is not a matter of opinion, though. In these (warmer, lower-altitude, coastal) areas of California it is mostly up to the grower to decide which natural component (acids vs. phenolics) is more important to him; since nature hardly will provide him with optimum levels of both. I have worked hard to adjust the rate of sugar increase in our fruit, in particular for the "Dijon" clones of Pinot Noir. We adjust the leaf area on each vine to match the crop level. If my vines run out of water, I irrigate them. If my musts taste low in acid, I add high-quality tartaric produced only from recovered wine lees to adjust them for what I consider proper balance. I don't allow nature to dictate that I must make wines from grapes that are not physiologically ripe by all the parameters I assess.